Pat McCord Amacher is a former journalist and writing teacher who was part of the collaborative project of writing Norma Paulus's recent "autobiography" for OSU Press. I'm a big fan of Norma Paulus, an Oregon politician who was the first woman elected to a statewide office in Oregon when she won the election to become Secretary of State in 1976. Her story in an inspiration. Pat recently took time to answer questions for Rose City Reader about this new book and its wider implications, among other things! Before we get to the book, can you introduce us briefly to Norma Paulus? Norma Paulus was born in 1933 in Nebraska and brought to Oregon as a toddler by her family, who lost everything in the Dust Bowl. Her love of learning and her high intelligence eventually took her to Salem as a legal secretary where, without benefit of college, she was able to attend law school and graduate with honors, launching her on a wide-ranging career in state politics. From her early triumph in co-founding the Oregon Women’s Political Caucus and helping to pass the ERA in the 1970s, her brilliant management, as secretary of state, of the state’s voting fraud crisis fomented by the Rajneeshee cult in the 1980s, and her nationally-recognized work in k-12 education reforms of the 1990s as superintendent of public instruction, Norma has met every new challenge with singular focus and boundless energy. A visionary with a firm grasp of the big picture and a steady eye on the tiniest details, Norma was a public servant whose storied career bettered the lives of all Oregonians. How did you come to be involved in the collaborative project of writing her autobiography, The Only Woman in the Room: The Norma Paulus Story? 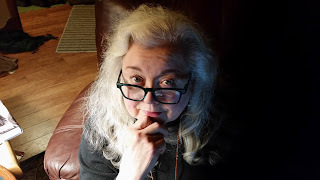 I’ve had the extreme good fortune to work with Gail Wells, a far more published author than I of books such as The Little Lucky and The Tillamook: A Created Forest Comes of Age. She and I co-wrote a book about the Hallstrom family of Eugene, who founded the Zip-O Log Mill in the early 1940s and have kept it going strong. Soon after we finished the book in 2013, Gail was contacted by the Paulus family about their project. She called me to co-author, and we two leapt into the breach with alacrity! Gail and I enjoy working together; we have different strengths and weaknesses as writers that seem to complement each other well. With sexual harassment and #metoo in the news so much these days, do you think Norma Paulus – who launched her political career in 1969 – has anything to teach women today? I would love to speak to Norma about this. She said she never considered sexism an issue until she ran for office the first time and then it smacked her square in the face. But what I take away from her story is her strong, even unassailable, sense of her own worth. She recounted only one instance of a male colleague who tried to compromise her, and repeated it more as merely a funny story about a man who had an overly high opinion of himself and how women perceived him. Norma’s confidence in her ability to get things done on her own kept her from being vulnerable to men in power, I think. She was so fearless and determined that no predator could have taken her down. I think what she would want to teach us is just what is happening today: Tell the truth, don’t back down—Time’s up! Do you think her story has appeal to an audience outside Oregon? I believe that wherever feminists live, and I hope that’s everywhere, they would find Norma’s story quite appealing. Her history shows a woman making a real difference in a man’s world without compromising her ideals, passions or goals. As a native Midwesterner, I found Norma so familiar. Her youth spent in poverty that she escaped without becoming a victim, either of circumstance or bitterness, bore a strong resemblance to stories I heard as a child from my parents and their generation, who survived the Great Depression and seemed to do very little whining about it. I love that “can-do” attitude they had, that lack of cynicism, the whole “it’s not what happens to you but how you respond to it” thing. I believe it’s something we all like to read about. Please tell us about the source materials you had available to write the book. It sounds like a biographer’s treasure trove. Apart from our primary resources -- Norma’s two oral histories and a series of audio interviews she did in around 2010 -- Gail and I were blessed to be granted full access to the Paulus papers archived in the Mark O. Hatfield Library at Willamette University and the Paulus archive in the research library at the Oregon Historical Society. At Willamette, the librarians greeted us on each visit with carts loaded with large document boxes mainly arranged chronologically. We saw everything from notes passed around the floor of the House by legislators to personal communiques, cards and letters, reams of press clippings ranging from an interview with Norma just before she graduated from law school to pre-election profiles of her that grew ever more expansive with each new office she sought, along with scads of photographs taken at every stage of her life. Truly it was like discovering Aladdin’s cave! At the OHS, the archives were arranged more thematically and were no less fascinating. For example, for the chapter I wrote about the Rajneeshees in Oregon, the pertinent boxes contained not only voluminous press clippings but numerous letters to Norma from voters who grew increasingly concerned about the growing crisis, court documents and transcripts, truly eye-opening issues of the Rajneesh newspaper, voter registration spreadsheets and more: it was as if a documentarian had boxed up everything needed to produce a feature on the episode (which OPB finally accomplished for Oregon Experience in 2012: “Rajneeshpuram”). The Norma Paulus Story is part of OSU Press's Women and Politics in the Pacific Northwest series. Can you describe the series a little? Are there more books planned? Three books have appeared so far, on Betty Roberts, Barbara Roberts, and Avel Louise Gordly. I’m unaware of others planned, although certainly the lack of book about Vera Katz is one profound lacuna. I think I was most surprised by the joy of research on this project. The hours we spent in the archives and researching online flew by, often uncovering patterns and threads of history we never expected. Apart from my years in undergrad and graduate study of the world’s greatest literature (and of course writing about it), I spent a decade-plus in teaching writing and literature at the university level. My other formative job experiences were in newspaper reporting and freelance writing. (This is not to say that my years spent as a pool lifeguard weren’t my favorite paid endeavor, but I can’t quite qualify the experience as “pre-writing” in any way.) I decided after leaving teaching and working briefly in marketing that I wanted to make “real writing” happen for me—one of those situations where I wrote that down somewhere in a notebook and gave myself a deadline. I don’t know why that seems to have worked, but, voila, here I am being interviewed by you! I love both fiction and nonfiction. I’ve been on a tear lately, for a couple of years actually, through books about the Wars of the Roses, a period of British history I never studied in my academic years, but right now I’m reading A.N. Wilson’s The Victorians. Historical fiction is a favorite. I’m three books into the Matthew Shardlake Tudor mysteries by C. J. Sansom, and just finished Pachinko by Min Jin Lee. I also like what I’d call “comfort reading,” so over Christmas I reread Rosamund Pilcher’s Winter Solstice, which is by no means great literature, but it’s so darn cozy and Christmassy, and naturally I had to grab Ken Follett’s new Pillars of the Earth installment, A Column of Fire, when it came out last fall, again for the plot, not the writing. The best book I read last year was The Nix by Nathan Hill—great plotting and great writing, the jackpot. My tastes are eclectic to say the least, but I don’t read science, either fiction or nonfiction. My retirement plan is to live long enough to read all the books I have stacked in the wings, and of course, the complete Shakespeare canon, one more time. What is the most valuable advice you’ve been given as an author? As a biographer? The best advice I’ve found, for writing or life, is summed up by Anne Lamott in Bird by Bird. One step leads to the next; we need only keep our eyes on the ball. It’s really true, and it’s a truly Zen attitude, something I strive daily to achieve. I’m one of those writers who is superstitious about discussing her work before it’s progressed past a certain point, usually contractual, so I’m going to say only that I have a few ideas. I would like to write a book sometimes on weekdays. Writing this book on weekends and evenings, after working my day job, is not something I’d like to repeat. One thing I continue to work on daily, under contract or not, is becoming a better, more disciplined writer. THE ONLY WOMAN IN THE ROOM IS AVAILABLE ON LINE, OR ASK YOUR LOCAL BOOK SELLER TO ORDER IT.